A minimal and fast hugo theme for bloggers. 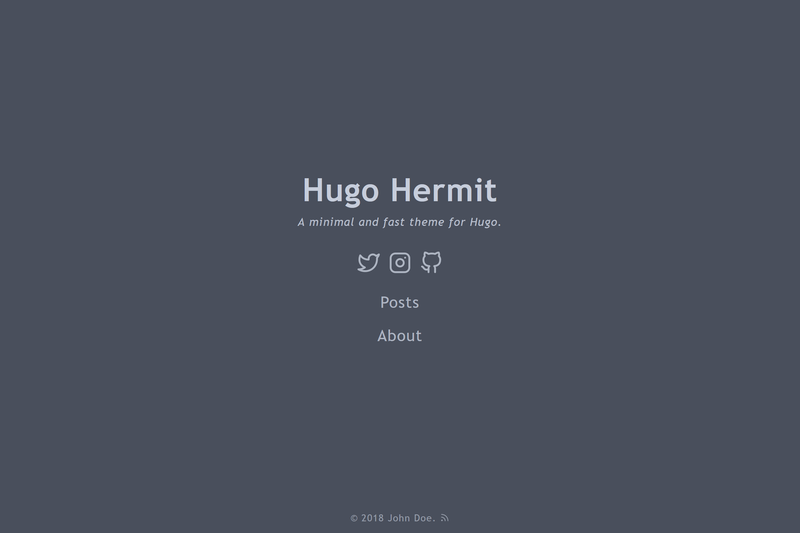 Hermit is a minimal and fast theme for Hugo. It’s built for bloggers who want a simple and focused website. A single-column layout and carefully crafted typography offers a great reading experience. Navigations and functions are placed in the bottom bar which will hide when you scroll down. Featured image is supported. It will be displayed as a dimmed background of the page. Displays all of your posts on a single page, with one section per year, simple and compact. Extremely lightweight and load fast. No third party framework, no unnecessary code. Responsive & Retina Ready. Scales gracefully from a big screen all the way down to the smallest mobile phone. Assets in vector format ensures that it looks sharp on high-resolution screens. Alternatively, if you are not familiar with git, you can download the theme as a .zip file, unzip the theme contents, and then move the unzipped source into your themes directory. For more information, read the official documentation of Hugo. The example config file can be found in the theme’s exampleSite folder. You can just copy the config.toml to the root directory of your Hugo site. There are instructions in the example config file, feel free to change strings as you like to customize your website. If that’s not enough, you can see Overriding templates section. You can modify or add any svg icons in site’s layouts/partials/svg.html. We only have built-in support for Disqus at the moment, if that doesn’t fit your needs, you can just add html to site’s layouts/partials/comments.html. If you prefer to use different analytics system other than google analytics, then add them inside layouts/partials/analytics.html. You can reference as many stylesheets as you want. Their paths need to be relative to the static folder or they can be network resources. You can inject any html code to every page’s document head or right above the closing body tag. This makes it easier to add any html meta data, custom css/js, dns-prefetch etc. To do this you simply need to create a file at site’s layouts/partials/extra-head.html or layouts/partials/extra-foot.html, code inside will be injected to every page.